Since the colonization of Latin America land use, distribution and ownership didn't occur in a natural way anymore. Before colonization, land use and ownership was pretty simple. Each Indian tribe defended its claimed territory, which was big enough to live from and small enough to defend against other tribes. "Living from" meant hunting, fishing, growing crops, keeping live stock, clean water and building materials for homes. The land was a communal good that belonged to the tribe, except for the individual plots which were used for personal housing and growing crops for personal needs. These individual plots represented a small trade value that resembled the labor that was put into it. Think of clearing, access, fertilizing and leveling the field. If a field or plot wasn't used anymore it lost its trade value and became communal land again. When the Spanish arrived in South America, they were mainly interested in profit, christianization and cheap labor. Because profits had to come from taxes and trade, Spanish settlers had to pay taxes on their production and were allowed to trade their products only with Spain. The only labor available were Indians. Profits on agricultural and mining production were maximized because cheap Indian labor was (ab)used. 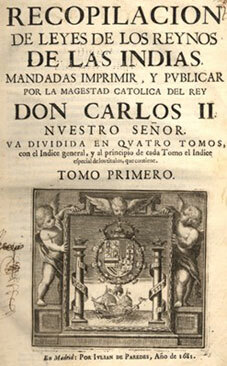 The Spanish brought with them the system of public property records, inspired in Spanish legislation, which was codified in the Ley de Toro law and later the Leyes de Indias laws. Book 4 of the Leyes de Indias described in detail the plans that were set forth for settlers on every facet of creating a community, including town planning and Registries of Deeds. The Spanish strategy of colonization was highly effective. 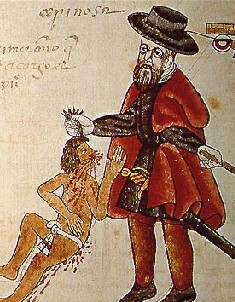 First perfected by Cortés in Mexico, it was based on the observation that the best way for the Spanish to subdue opposition was to capture the indigenous leader. This strategy enabled the Spanish to claim the accumulated wealth of the leader and coerce the indigenous peoples to give tribute and food. The next step was setting themselves up as the new elite of the indigenous society and taking control of the existing methods of taxation, tribute, and, particularly, forced labor. The most common form in which the Spanish occupied the land was the encomienda. 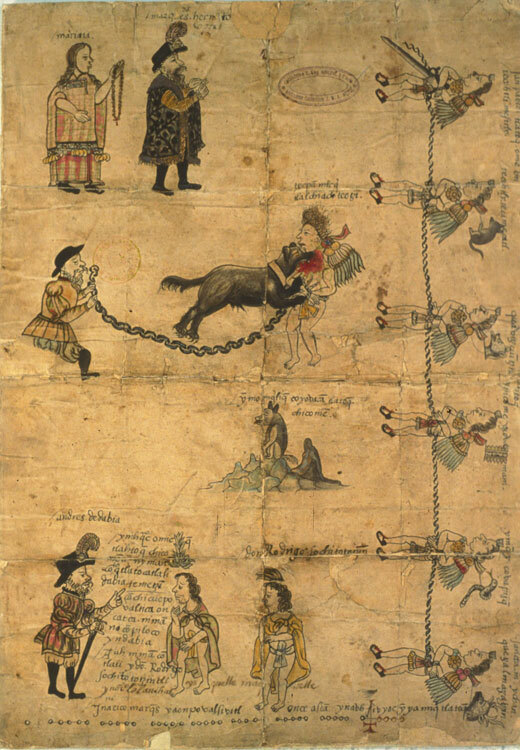 Settlers were granted land, along with its inhabitants and resources, in return for taking charge of defending the territory, spiritually indoctrinating the native population, and extracting the crown's annual tribute (payable half in gold, half in local products) from the encomienda's Indian population. Other Spanish institutions that were invented to maximize the exploitation of Indians were the mita (a system of forced labor used in the mines), and the repartimiento (the forced sale of goods to Indians, typically at highly inflated prices). This system gradually produced large haciendas (latifundios) worked by a "captive" labor force composed of huasipungueros. These huasipungueros worked without salary in return for the farming rights to minifundios (small plots) on the haciendas. In many cases, the huasipungueros were bought or sold with the hacienda. Since Spanish (and Portuguese) colonization, land in Latin America was owned by the Spanish/Portuguese elite and the land was worked by local Indians and slaves. After breaking away from Spanish dominion during 1810-1824, the elite society of large landowners remained and could grow extensively with the help of their liaisons with the military. The already bad position of indigenous peoples deteriorated further. Large landowners survived revolutions and often the revolutionaries became part of the oligarchy afterwards (Iron Law of Oligarchy). Take for example the Ortegas in Nicaragua and the Boligarchy in Venezuela. Today there is still a large landowner elite present in almost every L.A. country, despite land reforms in the past. L.A. countries scores are generally high on the Gini index. According to Daron Acemoglu and James Robinson's Why Nations Fail, L.A. countries still suffer from Spanish inherited extractive institutions, in contrast to the USA and Canada who profit from inherited English inclusive institutions. One could firmly argue that the history of Spanish Colonization is still the root cause of land conflicts in Latin America today. Latin America has seen in the past 500 years Conquistadors, Colonisers, Liberators, Caudillos, Dictators, Oligarchy and Revolutionaries. In the same 500 years Latin America has experienced many independence wars, rebellions, civil wars and International wars. During these wars lands were often confiscated or abandoned. If land records were not destroyed during a war than afterwards old land titles were often invalidated, re-validated or land was seized by the government and sold to new owners. Army generals or politicians were often rewarded by land gifts. Near the end of the twentieth century, the data for Honduras and Costa Rica indicate that at least half of the privately held land in agricultural use was without legal title. In Ecuador, at least 60 percent of the agricultural holdings did not have legal title as late as the 1980s. These plots often have been cultivated from generation to generation for many years and are usually held under a customary tenure regime The absence of land titles give governments the possibility to look at it as state owned land and to repossess it, to use it or to sell it. Even when this is not the case, without title, landholders do not have the legal means of protecting their rights to land. They also do not have access to credit to increase their production. Land seizures are still common practice today. For instance the late president-Chávez of Venezuela employed a law allowing him to seize lands that are deemed idle, not adequately used or lands of which the owners do not hold "legal" titles (That is - according to Chávez - land titles of which the propriety rights can not be traced back without interruption to 1830, the year of the foundation of the Republic of Venezuela). Another example is that of the land and property confiscations (La Piñata Sandinista) after the 1980 revolution in Nicaragua. Confiscations not only from large landowners (Somocistas) but from many small business owners too. The properties were redistributed to small farmer cooperatives and FSLN party members. A third example can be found in Colombia where large landowners (druglords) acquired their lands and land titles by having it "cleansed" from small farmers, who didn't have official land titles but did farm their lands for generations. This cleansing often was made possible due to the illegal collaboration of local authorities with large land owners. Collective land rights of indigenous peoples/communities are often denied as well and is obviously leading to conflicts. Many more examples of land seizures can be given. It is only a few decades ago that most L.A. countries became young democracies and it is only a few decades ago that most of them began to register property rights through a public register with the help of modern cadastral databases and a registry of deeds. When you want to purchase a peace of rural land in Latin America today, chances are high that you still need a lawyer to investigate the chain of deeds in the registry thoroughly. In Latin America the registry cadastre systems are generally not comprehensive. Public spaces and informal settlements (slums) are generally outside cadastral databases. Traditionally the deed registration proceeds without reference to the cadastre and without an assigned identification number. Often the descriptions of plots in the titles provide information about adjacent plot owners and sometimes information of the physical boundaries. Latin America has a long and rich history of cadastral and land titling projects stretching back to the 1980s and beyond. Currently almost every country in the region has a land administration project, incorporating cadastral reform, that is either in preparation or being implemented. Repair will require generating information from land cadastres, designing legal systems that guarantee property rights and implementing land titling projects to regularize ownership for thousands of small farmers who are living on their land on a de facto basis. The Inter American Development Bank, Worldbank, UN Habitat, USAID and other organizations have sponsored and are successfully sponsoring Land Titling & Registration Programs in Latin America. Never the less it is a long and winding road that's also costly. Many Latin American countries like to boost their agriculture sector, because it is important for domestic food security, their economy and exports (incoming US$ currency). That's why deforestation is so attractive to governments. Large areas of "unused" land get converted to usable land, while it doesn't cost the government anything. Successfully protecting forests against illegal logging is very costly and it is more beneficial and pragmatic to do nothing or very little. Logging companies will (illegally) carry out the deforestation, build the dirt roads, export the timber; settlers burn the stubs, and clear the land making it suitable for agriculture or cattle ranching. The state is often constructing roads in frontier areas and adopting patterns of agricultural growth favoring large-scale mechanized production and low employment generation. In many cases the state continues to support land clearing by granting ex post property rights to settlers (those who cleared the land). Large landholders often profit very much from the situation. Unfortunately property rights of indigenous peoples are often not recognized and is leading to many conflicts. In Colombia rural small farmer communities with no legal land titles have been violently removed from their lands on a large scale in favor of large landowners who took over the land to convert it to African Palm and Banana plantations. Land and property disputes tend to increase in the post-conflict period, particularly in the context of large-scale returns of displaced populations. So has happened and is still happening in Colombia. If these issues are overlooked, they are likely to threaten the fragile stability of post-conflict transitions. Land reforms in Latin America that benefit small (landless) farmers are often a source of conflict as well. The government often seizes land of large landowners and doesn't compensate them sufficiently and in some cases doesn't compensate them at all. Land conflicts often are complex and difficult to resolve because multiple parties claim the same land. For example in the Golondrinas Protected Forest Ecuador landowners, have legal deeds to tracts of land, which in many cases are not under cultivation or other ’productive’ usage. Meanwhile, campesinos take advantage of their rights under land reform legislation from the 1960s and 1980s to move onto ’unproductive’ land and commence farming or livestock-raising. Similarly, the Ministry of Environment of Ecuador has declared many of the relevant areas to be partially or fully protected for conservation purposes. Finally, in some cases indigenous communities have historical claims to the land, which may or may not have been resolved by the state. Mining conflicts in Latin America are plenty. El Observatorio de Conflictos Mineros de América Latina is presently counting 185. Conflicts arise for a number of reasons. Foreign mining companies often use local water resources, leaving less water for the local farmers. Mining companies often pollute local water resources, making it non potable and even toxic. Biodiversity is threatened. Unfortunately environmental laws are not always strictly enforced and officers can be easily bribed. Surface mining always requires clearing of the land and/or forests. Therefore farmers and/or indigenous people have to leave. Those farmers and peoples are usually not or barely compensated for their losses and often their land rights are disputed or invalidated by (corrupt) authorities. Politicians think that foreign capital-intensive mining in their country can boost the national economy, which isn't always true because profits are usually allowed to leave the country and the mining companies get tax redemption. Mining Conflicts Map of Latin America.